This week on the blog, I am debuting a new series of weekly posts entitled ‘The Bergman Files’. As you may have guessed, this series will focus on the works of iconic director Ingmar Bergman. Each week I will review one of his feature film cinematic releases, in chronological order. No small undertaking, with over 40 on that list. 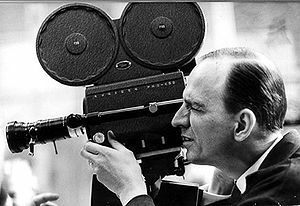 The great Ingmar Bergman at work. Why Bergman? A number of reasons. As you would probably guess, I watch a whole lot of films. But even someone who watches as many films as me rarely manages to cover off on a director’s entire filmography. When I think of my absolute favourite directors – Keaton, Malick, Lang, Hitchock, Welles etc – I haven’t even managed to see all of their films. So this kind of systematic approach will allow me to cover an entire life’s work. Secondly, Bergman is a director who has always simultaneously intrigued and intimidated me. As someone who has at times struggled with fear of mortality, reading the synopses of his films has often put me off ever wanting to watch them. However, The Seventh Seal, the only Bergman film I have seen, is one of my absolute favourites. And whilst the subject matter is challenging, the beauty of the art in that case at least, totally supersedes and reservations I had. I hope you guys enjoy this long series of posts. Hopefully there will be a few different things going on. I will be inviting some other bloggers to take the reigns for a review or two. The films, even those not on the 1001, will be graded using the beer rating system. And I will be keeping a ranking as I go, of my favourite Bergman film. As always, read, enjoy, share and comment friends. The other thing that will be happening alongside this series is a couple of competitions. So here are the details for competition number one. Courtesy of Madman Films, up for grabs are a copy of two early Bergman films on DVD – It Rains on our Love and A Ship Bound for India. To enter the competition you will need to engage with the first four blogs I post on Bergman films (for the two films on offer as well as Crisis and Music in Darkness), either on this site, or when I promote the posts on Facebook and Twitter. Entries will close one week after the post for Music in Darkness goes up on the site. Comment on the post on Facebook for one entry. Like the post on the website for one entry. Comment on the post on the website for one entry. I am really hoping that you guys will get involved with this new series of posts, and hopefully this will be the first of a whole bunch of giveaways. Entry is open to anyone, but just bear in mind the DVDs are Region 4. On facebook, only entries from those who ‘like’ the Not Now, I’m Drinking a Beer and Watching a Movie will be counted. Same deal with twitter, only those retweets from followers of beer_movie will be registered (this is simply because it is easier for me to contact the winner). I am really hoping that you guys will get involved with this new series of posts, and hopefully this will be the first of a whole bunch of giveaways. If you have any queries about the competition, or the series of posts, feel free to email me at drinkingbeerwatchingmovie@gmail.com or use the comments section.